Today, U.S. Representative Jim McGovern joined State Senator Richard Moore, the U.S. National Park Service (NPS), the U.S. Federal Emergency Management Agency (FEMA), local leaders and residents of Northbridge on a walking tour to highlight the town’s rich history and tour local businesses. (Northbridge, Mass.) – Today, U.S. Representative Jim McGovern joined State Senator Richard Moore, the U.S. National Park Service (NPS), the U.S. Federal Emergency Management Agency (FEMA), local leaders and residents of Northbridge on a walking tour to highlight the town’s rich history and tour local businesses. “I was particularly touched by the efforts Northbridge has undertaken to honor its fallen soldiers,” said McGovern after visiting the David Casey Memorial and other war memorials. Congressman McGovern was joined by State Senator Richard Moore; Ranger Chuck Arning, NPS; David Parr, FEMA; Rosemary Scrivens, Regional Director of MA Office of Business Development; Jeannie Hebert, President and CEO Blackstone Valley Chamber of Commerce; Catherine Stickney, Superintendent of Northbridge Schools; Carol Brouwer, Chairman of the Northbridge Historical Society, local business leaders and residents of Northbridge. The tour culminated at the Northbridge Fire Department where FEMA Representative David Parr presented Fire Chief Gary Nestor with a $712,500 Assistance to Firefighters Grant award to purchase a new aerial ladder fire truck. 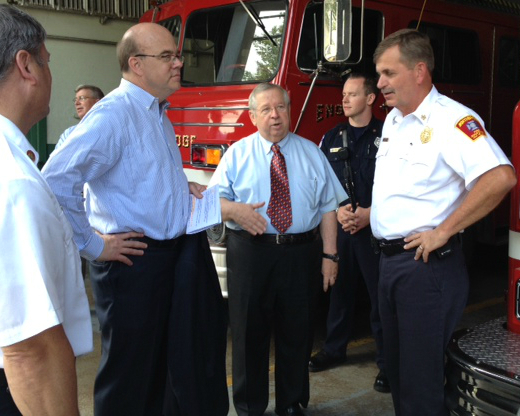 This is the fourth community tour that Congressman McGovern has participated in this summer. In July, he visited Sutton alongside Town Administrator James Smith, accompanied State Representative Mary Keefe on a walk through the Lake Avenue section of the City of Worcester and joined Mayor Joseph Petty in Worcester on walk to promote exercise.